Jacob starts by summoning Bujin Mikazuchi and activating Kaiser Colosseum. He sets 2 and passes. Jean-luc starts with Banisher of The Radiance, which gets hit by Jacob’s Bottomless Trap Hole. He sets 3 and passes. Jacob attacks for 1900 with Mikazuchi and sets 1, then passes. Jean luc summons Green Gadget and searches for Red. He then ends his turn. Jacob summons Bujingi Turtle and attacks over Green Gadget. Jean-luc tries to save it using Safe Zone but Forbidden Lance is used it in response, resulting in Jean-luc taking 1100 in damage, followed by 1900 from Mikazuchi. Jacob XYZ summons Susanowo but it is quickly spun away by Compulsory Evacuation Device. He banishes Mikazuchi for Hirume and passes. Jean-luc activates Mystical Space Typhoon to destroy Kaiser and summons Red Gadget, with its effect as chain link 1 and kagetokage as chain link 2. He XYZ summons Number 101: Silent Honor ARK and takes Hirume (Jacob chooses not to use his turtle) as an XYZ material, then attacks and gets hit by Dimensional Prison. Jacob draws Fire Formation – Tenki and using it searches Bujin Yamato. In the end phase he adds Bujingi Hare to hand and then sends it to grave with Yamato. Jean-luc summons Banisher and attempts to attack Yamato, Jacob uses Hare on attack declaration targeting Yamato. In the damage step Jean-luc uses Forbidden Chalice to raise banishers attack. Jacob sets 1 and trys to attack banisher, but is met with another chalice. Jean-luc summons Tin Goldfish which summons Yellow Gadget. 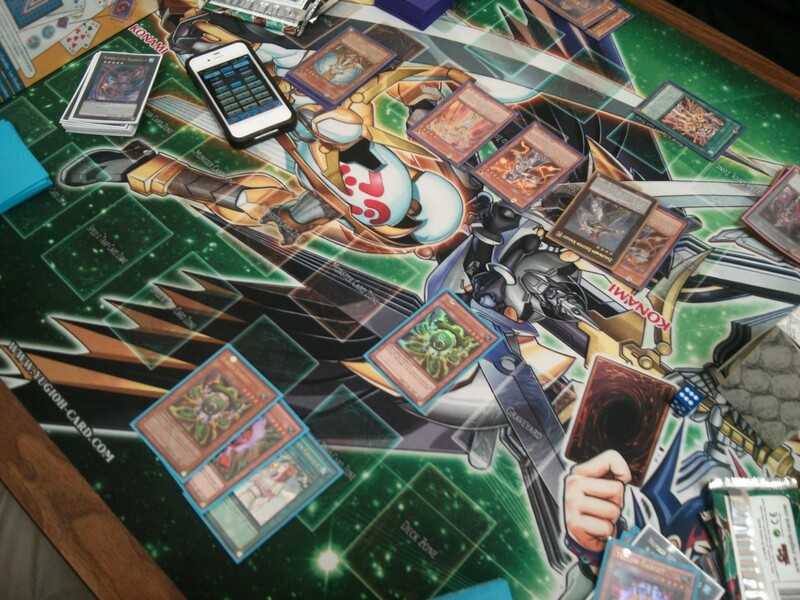 Yellow searches Green and he XYZ summons Gear Gigant X with the on field pair, searching Tin Goldfish with its effect. Banisher attacks for 1600 but Gear Gigant is hit by Dimensional Prison. Jacob sets 1 and passes. Jean-luc draws and summons Tin Goldfish which summons Green Gadget. Green searches and Jean-luc XYZ summons King of the Feral Imps and searches Kagetokage. Both monsters attack direct and Jean-luc passes. Jean-luc wins game 1 thanks to a consistent stream of XYZ summons. Jacob decides to go first. He activates Tenki searching Yamato and sets two card. In the end phase Yamato adds Mikazuchi to hand and sends Turtle to grave. Jean-Luc blindly uses Mystical Space Typhoon to snipe a set Compulsory Evacuation Device. He normal summons Red Gadget, activating its effect and chaining Kagetokage. Red searches Yellow and then Jean-luc XYZ summons into Number 103: Ragnazero and activates its effect, targeting Yamato. Jacob protects it with the effect of Turtle. Jean-luc sets 3 and passes. Jacob normal summon Mikazuchi and XYZ summons Evilswarm Exciton Knight. Exciton hits Jean-luc’s set Macro Cosmos, Call of the Haunted and Dimensional Prison. Jean-luc summons Yellow Gadget and searches Green, then passes. 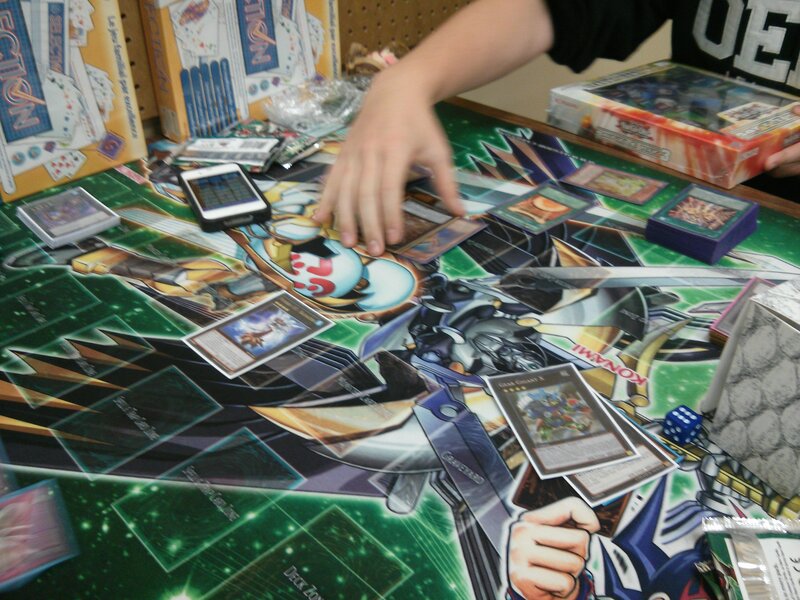 Jacob banishes Yamato to summon Hirume and attacks Yellow with Hirume, then attacks directly with Exciton Knight. He sets 1 card and ends his turn. Jean-luc summons Green Gadget and searches Red, then passes. Jacob summons Mikazuchi, then attacks Green Gadget with Hirume and uses Honest to boost its attack, then attacks directly with the rest of his board for game. Game 2 was seized by Exciton Knight, with Jean-Luc unable to recover from losing his field presence. Jean-Luc decides to go first, he summons Thunder King Rai-Oh and activates Dimensional Fissure. Jacob exclaims his displeasure with an “eww”, then sets 1 card. He summons Mikazuchi and attacks into into Thunder King destroying both monsters, then passes. Jean-luc normal summons Yellow Gadget, uses its effect and chains Kagetokage. He XYZ summons King of the Feral Imps and is stopped cold by Bottomless Trap Hole. Jean-luc sets 1 and passes. Jacob normal summons Yamato. he attacks for 1800, then in main phase 2 sets 1 card. In the end phase he adds Mikazuchi, then is forced to banish Hirume from his hand because of Dimensional Fissure. Jean-luc summon Tin Goldfish, which summons Green Gadget. Green searches red, then Jean-luc XYZ summons Gear Gigant X. He uses the effect of Gear Gigant to search Tin Goldfish. Gear Gigant attacks and is decimated with a damage step Forbidden Lance. Jacob normal summons Hare and attacks direct with it and Yamato. During his main phase 2 he XYZ summons Exciton Knight and activates its effect, killing Fissure and a set Macro Cosmos. Jean-luc once again summons Tin Goldfish, summoning Red gagdget and using its effect. He XYZ summons Ragnazero and attacks over Exciton. He sets 1 and passes. Jacob activates Bujincarnation, summoning Yamato and Mikazuchi. He XYZ summons Kagutsuchi, which has its effect negated by Forbidden Chalice. Jean-luc then uses Ragnazero to destroy it and draw 1 card. Jacob normal summons Yamato, activates Kaiser and uses Yamato to add crane send Mikazuchi. Jacob summons Bujingi Crane and XYZ summons Susanowo. He uses the effect to search Crane and attacks for game! 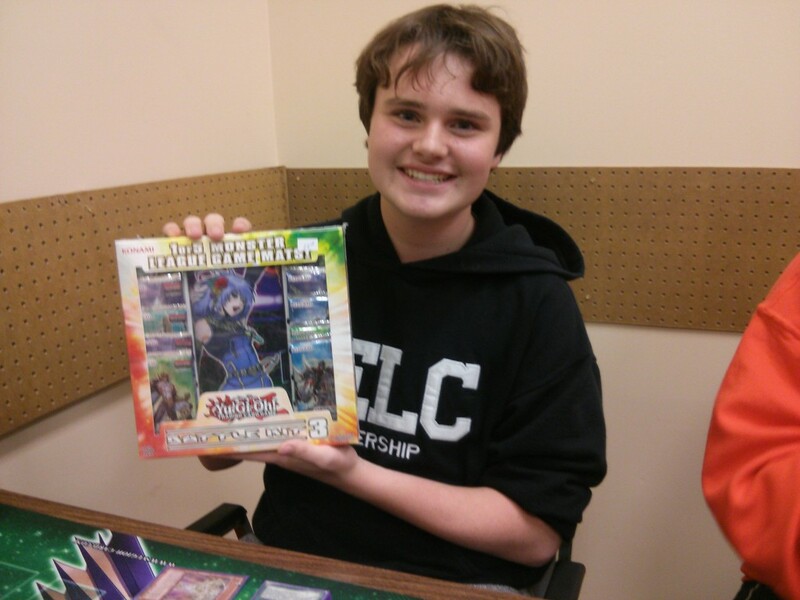 Jacob wins the finals and scores a kit of battle pack 3 (in addition to his other prizes from making it to finals)!